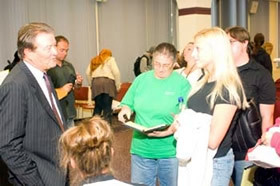 "60 Minutes" correspondent Steve Kroft visits with journalism student Kristina Krykhtin after a question-and-answer session with UAlbany students. ALBANY, N.Y. (September 17, 2007) -- The University at Albany today presented award-winning 60 Minutes correspondent Steve Kroft with the institution's highest honor, the Medallion of the University, in recognition of his sustained commitment to journalism. In addition, Kroft shared his experiences with students during a question-and-answer session, moderated by Times Union editor Rex Smith. "We are honored to celebrate the early successes of UAlbany's journalism program with one of the most esteemed journalists of our day," said Officer in Charge and Provost Susan Herbst. Journalism was offered as a major at UAlbany for the first time in 2006, becoming the first such major among the State University of New York's four University Centers. More than 90 students have declared journalism their major and a total of 630 students are enrolled in journalism courses, up from 253 last year. "I want to thank the University for this wonderful honor and the invitation to help celebrate the journalism major at the University at Albany. It has also provided me an opportunity to escape New York on a beautiful fall day and spend some time with college students, which is always invigorating. Plus, I get to visit Andy Rooney's home town. I'm relieved to report that the current residents aren't nearly as grumpy as he is," said Kroft. "Throughout his career, Steve has remained committed to the highest standards in journalism, and he serves as an inspiration to our students who strive to pursue journalistic excellence," said Edelgard Wulfert, Acting Dean of the College of Arts and Sciences. Kroft's investigative reporting has garnered him much acclaim, including three Peabody Awards -- television's top honor -- and 11 Emmy Awards, one of which was an Emmy for Lifetime Achievement in 2003. Kroft joined CBS News in January 1980 as a reporter in the Northeast bureau in New York. He was named a correspondent in May 1981 and worked out of the Dallas bureau (January 1981- May 1983). Kroft was also a foreign correspondent for CBS News based in the London bureau and a principal correspondent on the CBS News magazine West 57th. He was named a correspondent for 60 Minutes in May 1989. Some of his ground breaking reports include a friendly fire incident in the Gulf War; a profile of Senator Bob Dole; the Cuban government's quarantine policy for people infected with AIDS; Pakistan's political instability, its nuclear weapons and its ties to Islamic militant groups such as the Taliban; risks posed to the nation's water supply by the gasoline additive MTBE; and Chernobyl. Kroft's exclusive interview with then-Governor Bill Clinton and his wife, Hillary, in 1992 ended up on the front page of virtually every newspaper in the country and is continually cited as one of the defining moments of that presidential election. Kroft graduated with a bachelor's degree from Syracuse University in 1967 and later earned a master's degree from the Columbia University Graduate School of Journalism. He also served in the U.S. Army during the Vietnam War, where he was a reporter for the Armed Forces Network and covered his division's participation in the invasion of Cambodia. Kroft won several Army journalism awards for his work and a Bronze Star Medal for Meritorious Achievement. UAlbany's journalism program introduces students to the rapidly changing world of innovative media technology, while also drawing from its dedication to training young journalists in the areas of critical thinking, clear and effective writing and editing, and the historical, legal, and ethical contexts of contemporary media. In addition, the program prepares students to consider careers in cybermedia, magazines, governmental public information, advocacy communications, public relations, freelance writing, and book publishing. The University at Albany's broad mission of excellence in undergraduate and graduate education, research and public service engages 17,000 diverse students in nine schools and colleges, and an honors college. For more information about this internationally ranked institution, visit theUniversity at Albany. Visit UAlbany's extensive roster of faculty experts.